If you have a job that offers a Flexible Savings Plan (FSA), you’re probably familiar with the old ritual of either running out of money in the account halfway through the year (hi, me at my old jobs), or having a ton of cash left over at the end of the year. That causes a mad dash scramble to pick up FSA eligible items like 1,000 band-aids or new glasses. But did you know that there is such a thing as FSA eligible sunscreen as part of the list of FSA eligible expenses? And some of these luxury sunscreen brands are the same you can find at Sephora or luxury retailers. Something I recently discovered is that Amazon has an FSA store. 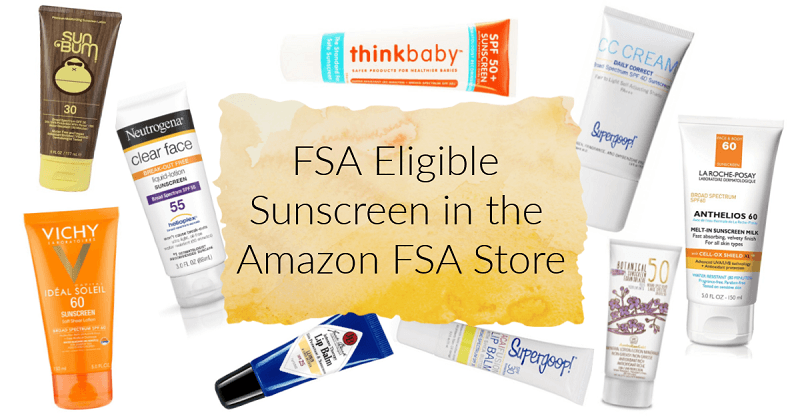 And the Amazon FSA store sells…wait for it…FSA eligible sunscreen. With first-rate and luxury brand sunscreen. Yes! There is so much awesome stuff in the Amazon FSA store (whoever thought I’d be excited about medical supplies??). This is a combination of nerding out over sunscreen and loving that I can use pre-tax dollars on these amazing brands that are FSA eligible expenses. So dorky, sorry. When I had hip labral tear surgery last year we used our FSA account to prep a bunch of things I’d need after surgery like band-aids and Ibuprofen. I think I went to CVS to pick everything out in person, but yo. If I had known I could have gotten all this stuff freaking delivered to me, and that it would all be curated in one place so I didn’t have to wonder what was FSA eligible or not, I would have been all up in it. So I was scrolling through the Amazon FSA store and noticed some luxury sunscreen brands that are FSA eligible expenses. That got me excited about spending down the FSA this year. Quality sunscreen can cost a pretty penny, so it’s wonderful to know that FSA dollars can be used for it. 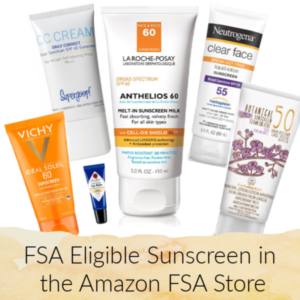 Here are my favorite FSA eligible sunscreens that I found in the Amazon FSA store. You can buy some of these in stores like Sephora and Ulta, so it was especially exciting to find some of these luxury sunscreen brands in the Amazon FSA store! 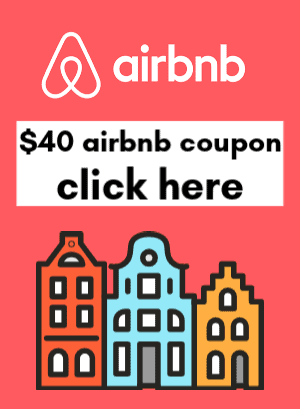 This site makes use of affiliate links, which means I might make a small commission if you purchase something I recommend, at no cost to you. Vichy Capital Soleil SPF 60 Soft Sheer Sunscreen Lotion ($30.50) offers broad spectrum UVA/ UVB protection and fights free radicals which cause skin aging. It has a unique combination of UV filters and Vitamin E and White Grape extract antioxidants to protect skin at the cellular level. It’s water resistant, PABA-free, and oil free. Supergoop! Daily Correct CC Cream SPF 35-40 ($34) is a foundation, concealer, and has SPF 35. It’s perfect to wear alone or layer under foundation and it contains 100% mineral actives, like Zinc Oxide. The CC cream corrects the look of fine lines, wrinkles, and pores. Daily Correct CC Cream is made with Apple Extract, Irish Moss, and Sodium Hyaluronate to make skin brighter and protect against free radicals. Coola Suncare Mineral Face SPF 30 Sunscreen Matte Tint ($32) is a luxe tinted sunscreen loaded with Shea Butter, Plankton Extract which can help restore moisture, and Rose Hip Seed Oil to soothe skin. Reviewers rave about its matte finish and even coverage. Neutrogena Clear Face Liquid Lotion Sunscreen SPF 55 ($8) is a liquid-lotion with a light-weight texture that leaves a matte finish. It’s made with with Helioplex Technology, which offers superior protection from aging UVA rays and burning UVB rays. I have this sunscreen and like it because it’s fragrance free and non-comedogenic, so it won’t clog your pores. Neutrogena Ultra Sheer Dry-Touch Sunscreen SPF 100+ ($10) has dry-touch technology which absorbs into skin fast for a clean and light feel. Like the face sunscreen above, it is formulated with Helioplex Technology, which offers broad spectrum protection from UVA and UVB rays. Fast-absorbing and water-resistant, this non-greasy formula is non-comedogenic and PABA-free. Sun Bum Original Moisturizing Sunscreen Lotion SPF 30 ($16) is hypoallergenic and reef-safe, so you can feel good snorkeling and swimming. Vegan ingredients are used to protect against UVA rays, prevent premature aging, and moisturize skin. It’s non-comedogenic, Oxbenzone and Octinoxate free (common chemicals harmful to reefs),cruelty free, gluten free, and oil free. La Roche-Posay Anthelios Melt-In Sunscreen Milk SPF 60 ($27) is formulated with their exclusive Cell-OX Shield technology:. Like the others, it has UVA/UVB filters and antioxidants. Reviewers love its texture and ability to really melt right into the skin for easy application. It’s been tested by dermatologists, oil-free, and paraben-free. Supergoop! Everyday SPF 50 Sunscreen For Face and Body, with Sunflower Extract ($19) is the Supergoop! original. The water-resistant formula is a great fit for everyday use on face and body. It absorbs quickly and is lightweight, but offers ultra-moisturizing results from sunflower and rice bran extracts. It also contains natural extracts from citrus, basil, and bois de rose, so it smells fresh and clean. Sun Bum Lip Balm, SPF 30 ($4) is my favorite! I have the mango and coconut flavors and they taste so yummy that I don’t mind reapplying them all day. These little lip balms are hypoallergenic harmful ingredients. They’re made in the USA with vegan ingredients like Coconut Oil, Aloe Vera and Vitamin E.
Supergoop! Fusion Lip Balm SPF 30, Acai ($10) is considered a luxury product, but it is FSA eligible. It’s made with hydrating shea butter, honey, antioxidants, and is a pretty pale pink/sheer color. I am definitely going to pick up one of these with our FSA card. Jack Black Intense Therapy Lip Balm SPF 25 ($8) is made with Vitamin E, shea butter, and Green Tea Antioxidants with a slight mint flavor. Baby Bum Mineral Sunscreen Lotion SPF 50 ($14) is formulated especially for kids with naturally moisturizing ingredients like coconut oil and shea butter. It’s lightweight and non greasy and promises to blend easily into skin. Best thing is there is no fragrance or dyes, and it’s gluten free, too. ThinkBaby ($15) is made in the USA and promises to not use harmful chemicals for you or kids. Their sunscreen is mineral based and water resistant so kids can play all day in the sun and water. Australian Gold Botanical Sunscreen Mineral Lotion for Kids SPF 50 ( $13) is also a gentle mineral-based formula. It’s hypoallergenic and tested by dermatologists and pediatricians. it dries to a powder-like matte finish, so it doesn’t feel oily on the skin. So that’s it! My roundup of the best FSA eligible items in the Amazon FSA store! Let me know if you think you will use your FSA card for sunscreens this year. I think it’s the perfect way to use unused funds for FSA eligible expenses, and I love that it’s just like “regular” shopping at Amazon. Plus, they carry many favorite and loved sunscreen brands.